World wide there are between 280 and 310 different species of clematis (depending on which authority is consulted), many of which already thrive in Mediterranean climates. The intention is to ensure gardeners in these climates are aware of some of the other clematis that are slowly becoming more available to us. If global warming is a true fact of life, then what Mediterranean gardeners do today, UK gardeners will be doing in a few years time! Large flowered clematis account for the bulk of at least 5000 cultivars world wide but amongst the true species, only 3 of the approximate 300 were large flowered. One of those, C. lanuginosa is now considered extinct, leaving us with just C. florida and C. patens. As large flowered types are much more demanding of time and effort, they are best grown in containers that can be moved as necessary as the seasons progress. Also, in a container, suitable composts can be provided to ensure the roots of this type of clematis can obtain ample nutrients and moisture throughout the growing season. The rest of this article will concentrate on the species and other small flowered clematis, which are less demanding and eminently suitable for cultivating in a wide variety of climates and garden soils. Soil preparation is paramount to the successful long-term cultivation of clematis, however, we can dispense with one myth immediately. The acidity or alkalinity (ph value) of garden soil is of little relevance to most clematis. In fact, far from being “lime lovers” (as often preached in the UK), they are actually “lime tolerant”. The reason C. vitalba (the only clematis native to the UK) grows so well on chalk is much more to do with the free draining properties of chalk. Any value of ph between 5.5 and 8.5 is equally suitable for clematis, the important aspects of soil preparation are the gradual improvements necessary to make the soil deep, humus rich, moisture retentive and yet free draining. It may be necessary to add considerable amounts of grit to heavy clay soils but a well-worked clay-based soil will support the cultivation of most types of clematis. Poor quality and sandy soils will require regular additions of nutrients plus moisture retaining compost, both to support good root systems and to minimise moisture evaporation. Unlike large flowered clematis, which thrive when copiously watered and fed, the species and small flowered cultivars often resent being overfed. They can react by putting on an enormous amount of soft leafy growth but very few blooms. The soft growth can easily be damaged by strong winds, even more so if it is sunny and/or hot. In nature, these lovely small flowered clematis get by happily on what few nutrients occur naturally in their habitat, together with the humus from the annual leaf fall from their host or companion plants. Whilst a few clematis thrive in isolation, most clematis are sociable plants, happily sharing with almost any other plant that can provide means of support and/or shelter. Eventually, experience with trying different combinations of clematis and host plants will convince the gardener just which clematis should be grown with which host plant, until that time, some stunning combinations can be found in most of the recent books on clematis. Mediterranean type gardens are often already well stocked with native plants and introductions that were brought in many generations ago. Planting a young clematis amongst such plants needs careful preparation. The soil will already be criss-crossed with coarse and fine roots of the existing plants and these root systems may extend far and wide as well as to a good depth. If the new clematis is to succeed, its immediate rooting area must receive some protection against invasion by its more established colleagues. The existing plants have had thousands of years of evolution to get the best from whatever is available to their roots, whilst the clematis, certainly in its first two seasons, is not equipped to share its compost with such vigorous plants. There are a number of ways that can be used to prevent too much intrusion into the clematis rooting area but a very simple one is to make a bucket sized hole of about 30 to 35 cm diameter and 45 to 50 cm deep. Cut the bottom off of two large plastic pots and slide the base of one into the top of the other. Now you should have a solid sleeve, considerably larger than the clematis root ball and its compost. Ensure the base of the hole drains water away, (clematis love water but hate standing in it), place humus rich compost and fertiliser at the base of the hole, then slide clematis from its own pot into this sleeve, adding good compost. (In time, the clematis roots may grow deep enough to leave their protective sleeve, but by then, the root system will be able to cope with the competition of other, more vigorous plants). The top of the root ball can be a little below the top of your sleeve but small flowered and species clematis need not be set as deep as their large flowered relatives. Clematis wilt (stem rot) affects only large flowered clematis and the early large flowering types are affected more than the late large flowering types, this means that there is no need to set the smaller flowering clematis deep. All clematis being grown with other plants should be set on the north side of the chosen host plant to obtain what little shade is available. The solid sleeve around your newly planted clematis will prevent invasion of the more vigorous already-established plants into the compost you have added inside the sleeve. If you leave the top rim of your sleeve above soil level, the adjoining plant roots will not sneak in over the top. Give the clematis at least 5 litres of water and always remember that whenever you water it, give it enough to go down past the roots, thereby encouraging the roots ever downwards into cooler soil. Even in UK, many newly planted clematis fail due to being given water often but too little at a time. The roots of such clematis remain near the surface and quickly succumb when the soil temperature becomes too warm for them. Which clematis should be tried? c. flammula , c. cirrhosa and c. viticella are native to the area and are often found growing wild. They will all be very variable in nature, so it is worth noting any outstanding specimens (larger blooms or better scent) and then propagating them by layering or by cuttings. C. cirrhosa has given rise to a number of cultivars that are more endearing to gardeners than the species itself. C.’Freckles’ is by far the best, often blooming for 5 or 6 months, with blooms that are pink bells with vivid red freckling. Another one to try is C.’Ourika Valley’, a greeny cream with much larger blooms than normal. C.’Landesdowne Gem’ is red inside and pink outside, a wonderful colour for an evergreen clematis. It has one drawback because it is not a fixed clone. It is a ‘Sport’ from C. ‘Freckles’ and does on occasion revert back to that plant, only to be red again another year ! All the cirrhosas are evergreen in the winter but many of them will go completely dormant in a long hot summer, often disappearing below the undergrowth until early September when they re-emerge and can be in bloom again within about 6 weeks. . Another evergreen clematis, which blooms around the turn of the year is c. napaulensis. It’s blooms hang like cream and purple tassels. It too goes into a summer dormancy period the same as the cirrhosas. C. viticella occurs naturally in purple, pink, blue and various other shades. The true c. viticella has a nodding bell shaped bloom, whilst many of its cultivars and hybrids range from bells to completely flat upward facing flowers. Others to try would include the white flowered C. ‘Paul Farges’ (a hybrid between c. vitalba and c. potanini). This is a rampant plant even in UK , blooming for many months but luckily sterile, so no garden will be infested with too many of them. The species c. potanini seeds itself everywhere, so be warned. However many people love c. potanini and welcome its tendency to self-seed. In fact, there are a great many clematis to choose from, including the beautiful American types like c. texensis and c. crispa for summer flowering and another American one, c. terniflora for a wonderful autumn scent. Herbaceous clematis should not be ignored either because they can provide good scent as well as colour. C. ‘Aromatica’, c. recta and c. mandshurica for the scent, with C. ‘Arabella and C. ‘Alionushka for months of colour. If obtaining a good range of clematis plants is difficult, then why not try growing your own from seed. 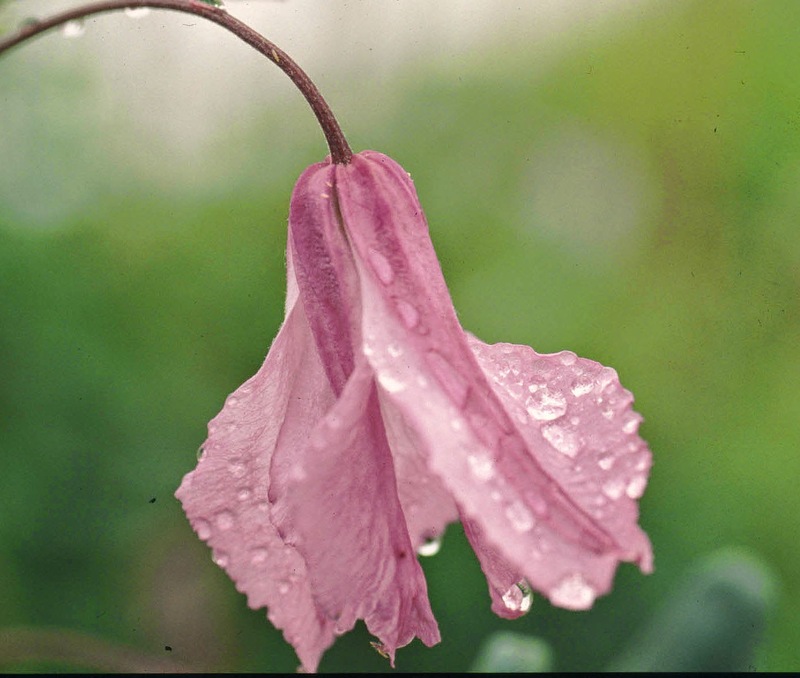 Both the British Clematis Society and The International Clematis Society have Seed Exchange schemes, where seed of unusual and rare clematis are offered for sale to members and to other gardeners. Both societies will have their current seed list on their websites. There is little in life that is more satisfying than seeing your own seedlings coming into bloom for the first time and clematis are not at all difficult to grow. Depending upon which clematis seed is being grown, germination can be as quick as 3 weeks or as slow as 12 to 15 months. Some of the seed set in the Algarve in mid November, was up and ready to transplant in early February. Information on growing clematis from seed is available on the same websites as the seed lists. If only one person from each gardening club/Horticultural Society became a member of the British Clematis Society (the larger by far of the two societies mentioned), then the rest of the members of that club would have access to an enormous amount of clematis information. Whilst it is certainly true that it is the large showy types that first attract most gardeners to clematis, it is also true that most devotees gradually include, and then move over to the smaller flower types almost completely. If you insist on only large flowered types in Mediterranean climates, you may well succeed eventually but you must be prepared to spend a lot more time with them, as well as risk the extra losses that will inevitably occur. You will also miss out on some wonderful scents, which include, vanilla, cinnamon, clove, lily of the valley, hyacinth, violet, cowslip, lemon and almond.